Lunch on the river during this 2.5-hour Lady Liberty cruise. 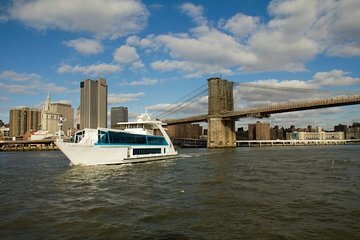 Step aboard the well-equipped boat at South Street Seaport and watch the scenery glide by as the boat cruises down the the East River, through New York Harbor and up the Hudson River. Dig in to the sumptuous buffet lunch and meet some new friends at your shared tables. Get your camera out for views of the Manhattan skyline, Ellis Island and the Statue of Liberty. On the way back to the seaport, sip coffee or dance to the onboard DJ's tunes.